W3C MWI fugitive creates alternative Mobile Web Authoring Practices. of WURFL , the primary open source tool for device capability recognition. (Global Authoring Practices for Mobile Development, GAP). context of W3C Best Practices , so we wondered what on earth was going on. We didn't need to remain curious for long. Question: Luca, what is this initiative of yours all about? Answer: GAP is a document aimed at mobile developers which was long overdue. than their own? The reality is that covering competitors' products makes no business sense. This is why everyone ended up producing the documentation that makes the most sense to them. Unfortunately, this situation creates a paradox: the audience of these guidelines, i.e. the developers, are the one left wondering what they should do to create decent mobile content that works acceptably well on all devices. There is a gap to be filled and this is where the Global Authoring Practices (GAP) document plays a role. to partecipate in the W3C Best Practice Working Group group. things turned out to work a bit differently. I felt very strongly that developers voice had very little power in that forum. W3C agenda and the agendas of other companies were driving the show. Also, there did not seem to be a will to clearly identify the scope of the project and everyone was happy with it. I decided to refrain from contributing. That was until a few months later, when I noticed that the mobileOK thing was getting pushed very hard by some of the partecipants. I consider MobileOK potentially harmful for my daily work and for the mobile industry in general. That's when I decided that a passive attitude would not be enough and I had to move to action. This is the first time I use my blog for a non technical issue. Everyone can partecipate and join the community but so far they're all women ! I'm developing a Flex 2 application and I'm playing with the LayouManager class (under the mx.managers package). I learned a lot of cool things. The LayoutManager is the engine behind Flex's measurement and layout strategy. Layout is performed in three phases; commit, measurement, and layou (as you can read on the Flex 2 Livedocs). 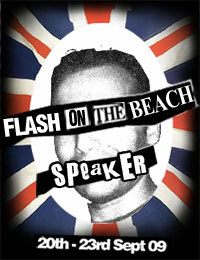 At application startup the Flash Player draws the contents (container and controls) on the client's screen. At this time a single istance of the LayoutManager is created and stored in the UIComponent.layoutManager property. A process called the Measurement/Layout phase has been executed. It's made up of two different steps that use a 2 pass algorithm. The first phase is the Measurement pass that has the role to calculate the size of each component starting from inside to outside. The second phase, named Layout pass, fires after every components have been measured and it sizes and positions the components. The Layout phase lays out application from outermost container to innermost. It's possible to trigger a Measurement/Layout pass, but you have to know what happens under the hood. When an invalidation occurs, it triggers the LayoutManager. Working with the LayoutManager class permits developers to better customize the layout and style of Flex 2 applications. As soon as I'll clean up my code I'll publish some examples on my blog ! (via their blog) Each component will be released individually on the Exchange, and can be used in your application simply by adding the pre-compiled SWC into your library path. Samples and documentation will be included as well. Finally, we will include the source so that you can modify the component as you see fit. It should be noted that we consider these components to be at Alpha quality. This means that we consider a component to be feature complete, but we may not have worked out every use-case and there may be some bugs. For example, while the components are written to support styling and skinning (in the same model as the Flex 2 framework), these areas may be less tested than others. As we see how customers are using the components and gather feedback we may release additional versions that include bug fixes, or expose more properties, or even behave differently. Of course we may also determine that the component is not useful for our developers and that we should focus on different ones. We will be releasing these components under a license similar to the Flex SDK. In essence you will be able to use and modify these components within the context of a Flex application, module, or library for no charge. Tomorrow Yahoo's first open Hack Day, a weekend festival of hacking, camping (yes, the tents-in-the-outdoors kind--we have really, really nice grass! ), music, and good times. 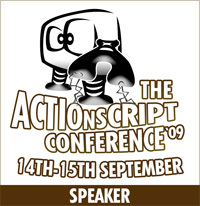 Mike Chambers, Danny Dura, Christian Cantrel, and Ted Patrick (all from Adobe) will be attending and participating. If you'll be there you'll see Apollo demos and presentations. See the Agenda of the event ! Digital Rights Management (DRM) is perhaps the most hotly debated subject in the media business today. To truly understand Digital Rights Management is to understand that the key word is "rights". A piece of music can belong to more than one party such as a songwriter and a composer, and they in turn often assign the management of their interests to an agent such as a music publisher, a record label or a Performing Rights Organization (PRO). Those companies in turn, are responsible for managing the rights of the owner of the work and ensuring that a piece of music is not used in a way that is not covered by a license. DRM simply adds software automation to this process. I found out this great white papers on Flash Security and Adobe Enterprise solutions to understand how to develop and deploy Flash and Flex applications securely. With the Flash technology, organizations can develop, deploy, and distribute with confidence RIAs, enterprise and mobile applications, and communications to employees, partners, and customers. Flash Player and the Flex product line leverage an organization’s existing security infrastructure (which means they are security independent) are based on existing accepted standards, and use secure technologies. information protection model against client-side threats. “[The Flex] architecture mitigates many common client-side attacks such as cross-site scripting, denial-of-service [attacks], SQL injection, man-in-the-middle [attacks], and session hijacking.” In addition, server-side security is maintained by leveraging J2EE security to mitigate common attacks against infrastructure components, such as buffer overflows, heap corruption, and cross-site scripting. 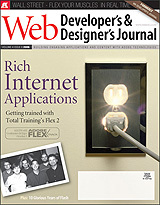 The new WebDeveloper's & Designer's issue is out. In this issue I wrote an article on Designing Loosely Coupled Flex 2 Components tecnique. Moreover they published a post on my blog on their BlogoSphere section : Flex-AJAX Bridge and the Unsupported setAttribute() method By IE. The new TheEdge issue is out and it's full of cool articles. One new feature of this issue is an interview with Edge managing editor Julie Campagna that introduces the September/October edition. Unfortunately I can't see any article on Flash Lite, but there's an interesting Flex 2 article that shows how ESRI provided next-generation mapping services using flex!